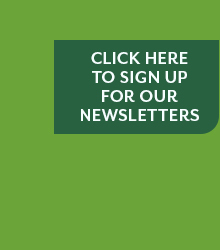 Once you’ve entered your email address, click continue and then select the Bloom Watch email list. Bloom Watch emails will update you on the progress of the blossoms right up to the day we announce Bloom Night. The Queen of the Night is here in abundance as Tohono Chul is home to the nation’s largest collection. 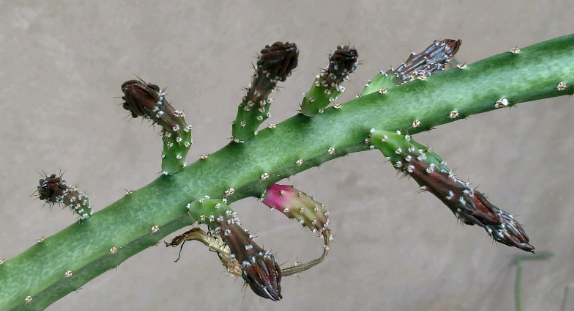 When the summer heat begins to build, the buds of the night-blooming cereus begin to appear. After a period of start-and-stop growth, the buds blossom in a mass blooming on one night between the end of May and late July. Experience the magnificent Peniocereus greggii in its full glory; stroll luminaria illuminated trails leading to each plant; marvel at their gorgeous flowers; breathe in their intense and intoxicating scent. Lea sobre Bloom Night en español aquí! Bloom Watch #4 – Will It Be This Weekend? Bloom Watch #3 – Will Rain Make Her Bloom? Enjoy reading the Bloom Watch Diaries? Check out all the blogs from 2017 and 2016! • Bring a camera with a flash. 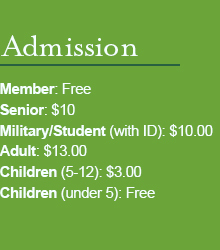 • Bloom Night is considered a special event and guest passes are not eligible for use. • Majority of flowers bloom the same evening usually between late-May and Mid-July. 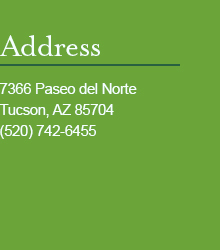 • Tohono Chul has the largest private collection of Night Blooming Cereus in the world. • Researchers still don’t know how the flowers know when to bloom en masse. • Each year 1,500 to 2,500 people attend Bloom Night. • Flowers start opening at 5 p.m. and are in full bloom by 8 p.m. It has a hallowed place in Tohono O’ odham storytelling, has inspired folk songs, paintings, thousands of photographs and even a perfume. 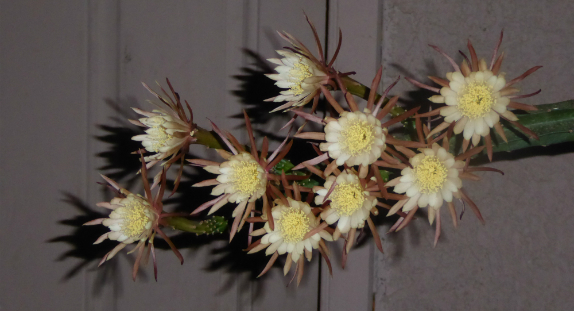 The Night Blooming Cereus, Peniocereus greggi, the aptly nick-named “The Queen of the Night”, creates an elusive flower, blooming en masse only one night of the year. Opening slowly at dusk the beautiful palm-sized flower is wilted within a few hours of sunrise. Tohono Chul, a non-profit botanical garden and nature preserve, on Tucson’s northwest side, has the largest private collection of Peniocereus greggi in the world. 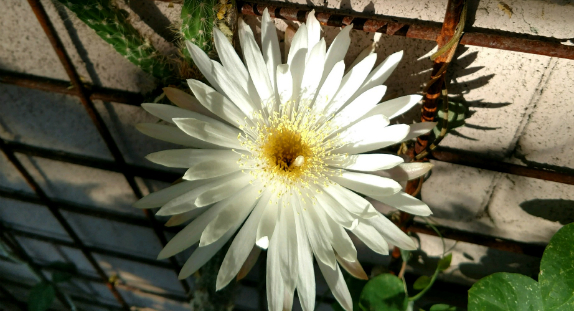 Native to Southwestern North America, the cactus looks like a bunch of dead sticks most of the year, only revealing its spectacular flower in the heat of the early Tucson summer. Since the cactus cannot self-pollinate, the plants must bloom on the same evening to ensure pollination, usually by hawk moths. The more blooms that are open, the greater the chances of pollination. The true mystery of the NBC is how the majority know when to bloom. “We’ve been studying the NBC for over 20 years now and we still don’t know what triggers the bloom. 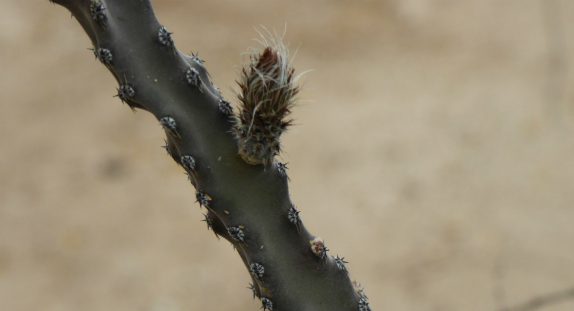 The best we can figure is there is some type of chemical communication amongst the cacti” says Lee Mason, Director of General Services for Tohono Chul. Tohono Chul planted and cultivated many of the cacti, others grew naturally on the grounds creating an amazing collection. Thinking it was a shame that the gardens were closed while these rare flowers were blooming, it was decided to stay open late for a few volunteers and their friends. It’s since turned into an annual event with thousands of people attending each year. 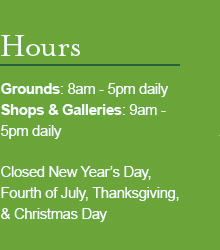 And that’s no small feat considering Bloom Night cannot be called until between 12pm and 4pm the day of the bloom. “We usually have a pretty good indication within a few days of the bloom, but they’ve tricked us before so we wait until we’re absolutely positive to make the call”, says Mason. Upon the official bloom call, Tohono Chul galvanizes its forces, contacting dozens of volunteers to help light the desert paths and organize tours, the media is contacted and local news crews descend upon the Park and the local populace changes its dinner plans to attend. 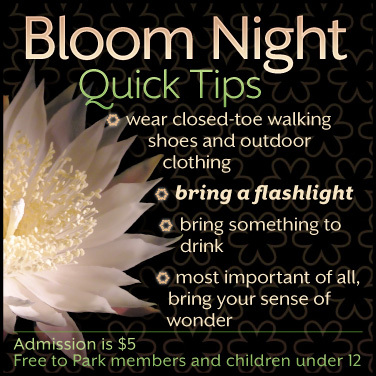 “It’s incredible how the entire community immediately reacts once Bloom night is called “ says Marcia Ring, Tohono Chul’s Marketing Manager, “This has truly become the quintessential summer event in Tucson, which, considering the uniqueness and beauty of the bloom, isn’t really surprising”.